This apple-inspired Project Artwork is a unique twist on the traditional “Cezanne’s Apples” still-life project that has been a staple of art teachers for decades! And the best part is, I have a full video tutorial that your kids can follow along with for FREE! 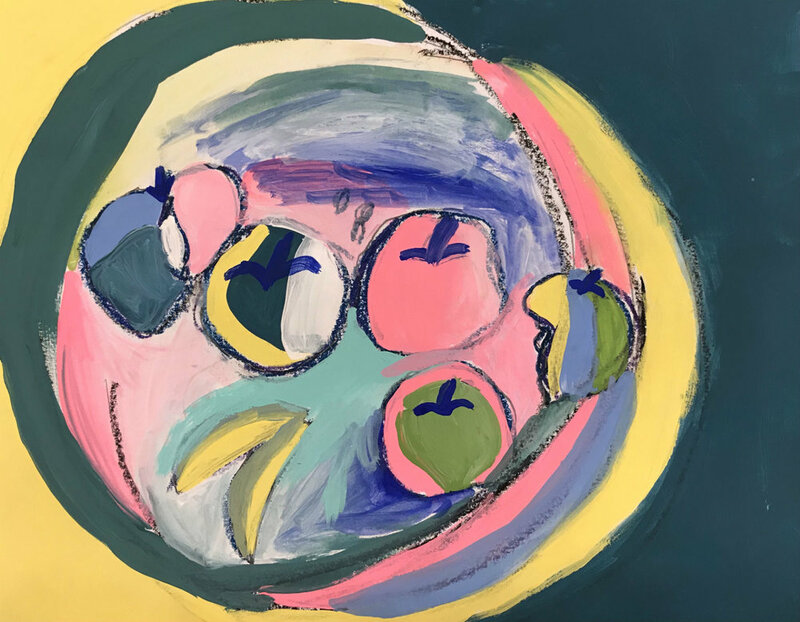 By combining the subject matter of Paul Cezanne’s famous still lifes AND the modern, cubist ideas of Pablo Picasso, we were able to create some very dynamic apple compositions! After spending some time learning about each of these famous artists, we discussed the elements of cubism. We learned how cubism shows multiple viewpoints of the same object within one artwork. We also discussed the differences between realistic art and abstract art. The first step was to trace a plate several times on our white paper to break up the space in an interesting way. Next, we drew the apples starting with the whole apple, and then cutting it into halves and quarters along the way so we could show multiple viewpoints like Picasso. Students decided if they wanted to draw their apples realistically or in a more abstracted manner. I encouraged them to use a variety of sizes and to allow their drawings to overlap each other. 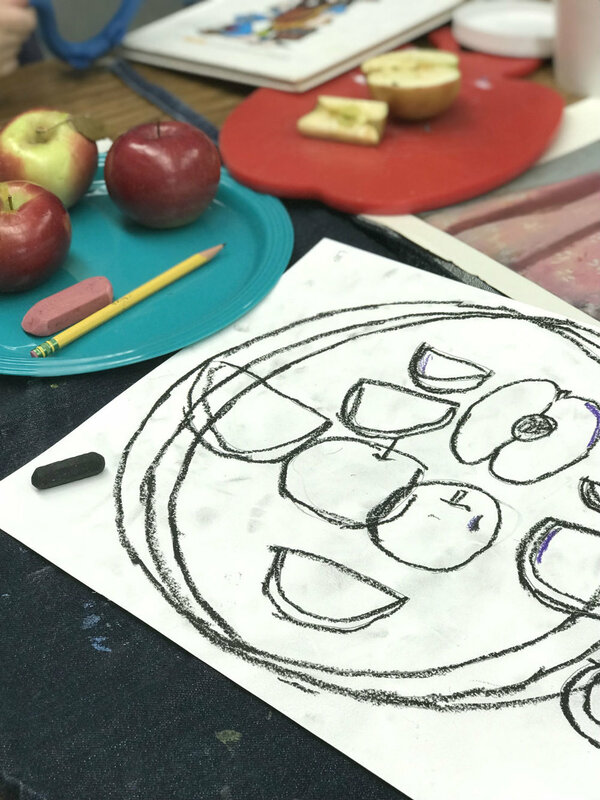 During the whole drawing stage, we turned the paper frequently and kept cutting the apples into smaller pieces so the artists were “forced” to mix it up a little:) Some of the kids even wanted to show the seeds or the core after taking a bite out of their apple! After we completed the drawing stage, we outlined the whole composition in dark-colored oil pastel. Finally, the last step was to paint the picture. We used acrylic paints and tried to mimic the choppy brushstrokes of Cezanne. I encouraged the students to use one color at a time and fill in various shapes on the page in a way that created a “color trail” through the composition, sort of like following animal tracks! Every year, Johnny Appleseed’s birthday rolls around right at the beginning of fall. We love making crockpot applesauce and reading about how John Chapman spread apple trees in this country by sharing seeds wherever he wandered. 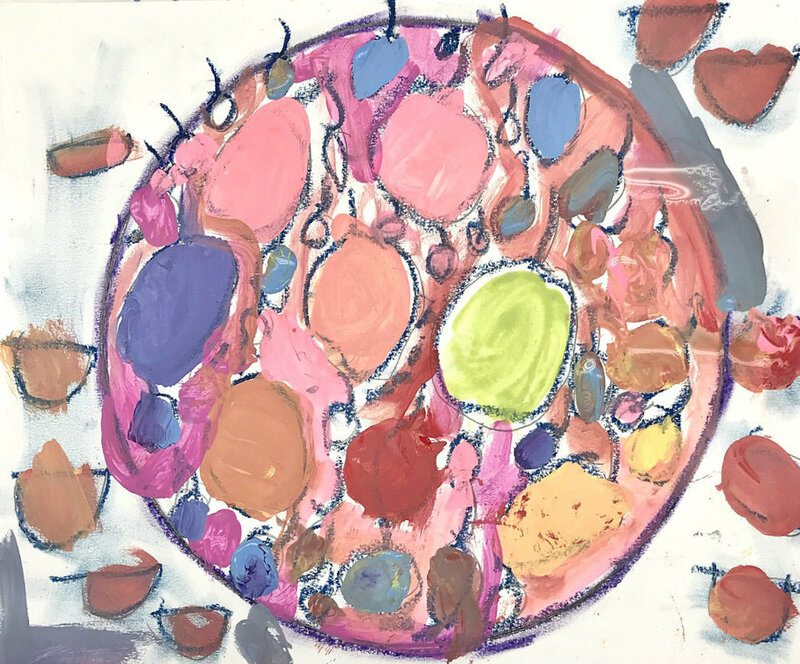 This Project Artwork lesson ties in beautifully with this theme and allows students the opportunity to learn some great art concepts and techniques along with it! I love how varied and beautiful these paintings always turn out! Would you like ME to teach this lesson to your young artists? Click HERE to access this lesson via video for free! I’ll explain all the supplies they will need and they can work through the Project Artwork right along with me, step by step! This Project Artwork lesson is a part of my FAMOUS ARTIST MASH UPS online art course for kids! Be sure to check out the other great artists your kids can learn about while creating some stellar art!